Emmanuel Christian Centre, in Lichfield, England, held a Lenten luncheon to raise funds for the farm. The meal was soup and bread, but the people paid for it as if it were a full-course meal. 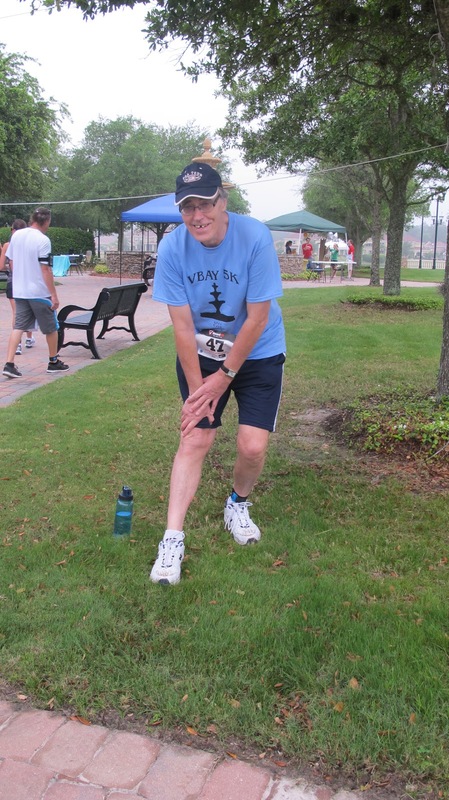 Venetian Bay United Methodist Church in New Smyrna, Florida, held a 5K race/walk and a portion of the proceeds went to the work in Kadawa. John won a second-place ribbon for his age group and Marty won a first-place trophy for her age group. We both walked the entire course (except Marty made a mad running dash the last 10 yards). There are only 2 photos of marty (TERRIBLE ONES). The one coming through the finish was the second go-around - she really made it 55 mins. + a few seconds (after having stopped to chat with friends at one of the water stations). It was such a surprise to get the prizes that a quick photo was nearly impossible, so John's head got cut off. We've sent you a lot of information via snail-mail recently, but it's time to put something on the blog. John went to Kadawa in January with Jeremy on a management trip, to see how progress was coming along on the farm and to encourage the continuing development of the various projects. He met with the Widows Farm Committee and the work continues - with a few hiccups here and there - and a rhythm is setting in. We told you about the shallow well digging process in our last blog, and of the delays in the process (that's Kenya). But here is some updated background about the development process and completion of the well. Much of becoming a mzungu (white person) farmer in Kenya is learned by the need to know and the need to have. We have several sponsors for banana bushes (they are not actually trees) for the farm. Bananas are a year-round crop and will feed many widows and are also a cash crop. When we planted the first two roots we learned that bananas require copious amounts of water. The closest source would require someone to walk about 1/2 mile round-trip carrying a 20-litre bucket of water for each plant. NOT PRACTICAL! (or humane). So, there was something new we learned (the need to know). 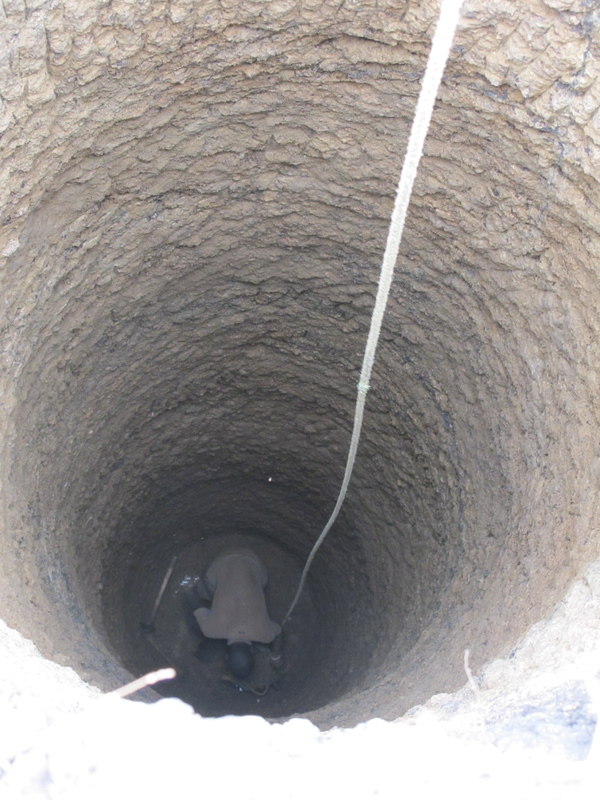 We realized that a well was a critical necessity (the need to have) - a shallow well, which is hand dug. We interviewed and got estimates from 3 contractors and selected the man for the project. Here is the neat part! We had not shared this need with anyone, and had no money. 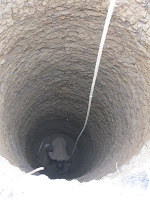 Yet we believed that we were to go ahead and begin to dig the well. Within a few days after we began to dig there were two deposits made into our African account that covered the cost of the well. The well is completed! Here are photos of the well from day one to completion. The contractor has recovered from his illness, (which was mentioned in the previous blog) the concrete rings are in place, and the cap has been put on. The water is very close to the top and right now is being hoisted by a bucket. Our goal is to get a portable generator and pump, and build a tower with a tank to store the water. We will also purchase drip lines (thin hoses with small holes in them) and run them down the furrows of the crops for irrigation (insuring crop growth). The following photos show the water level - before the rings went in - and the finished product. With the ongoing development of the farm it is necessary for us to have someone on the land 24/7. We also need storage for seed, fertilizer, the generator and other equipment, and the crops. So we have begun construction of a caretaker's house/barn. Once again, we learned the need; we hired an architect to draw plans, and felt that we were to go ahead a begin construction - with no money and without telling anyone of the need. Within days there was money in the account to pay for the foundation, which was poured the end of 2010. Laying the foundation was an engineering feat because of the type of soil; concrete pillars had to be poured deep within the ground before the slab was poured. Then we sensed that we should authorize construction of the walls and we received enough money to cover those expenses. The walls are now complete to roof level; however we must put in the metal windows and doors before we can do the roof. See the photos below of the house/barn so far. In the background you can see the church. Below you can also see the completed well in proximity to the house. The second crop was harvested in January. The second maize crop yielded twice the amount of the first one due to improved planting methods and fertilizer, along with the fact that the land had been improved by preparing the soil for the first crop. There was also a bean harvest with the second crop; the beans had been planted in the furrows next to the maize. Joel, the overseer of the distribution of the harvest, has seen to it that the destitute widows have all received an equal portion of maize and beans; also, assuring distribution of water to them. A third crop was planted in March and we will see it harvested while in Kenya this year; we will also be there for the next plowing and planting. The younger widows, who have formed a committee that sees to it that the work is done to plant and harvest, want a small piece of land to plant a cash crop (food that can be sold at market) to raise money for a medical and transportation fund. The purpose is to have money to get the destitute widows to the doctor or hospital for medical treatment. When they shared their vision with us we immediately told them they could have a quarter acre of the farm. That project will be further developed when we return to Kenya in July.